Amsterdam: Germany are winning again, and Croatia are struggling. The World Cup feels like a long time ago. After a year of problems off the field — and humiliation on it — the new Germany are finally starting to look like the old Germany. 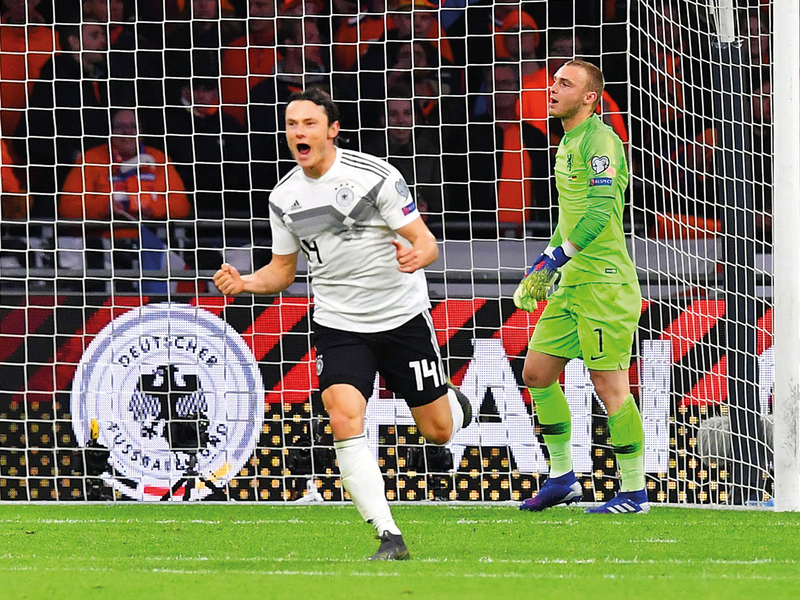 Grit, determination and Nico Schulz’s 90th-minute winner earned the Germans a confidence-boosting 3-2 win over the Netherlands on Sunday in a Euro 2020 qualifier. Croatia looked a shadow of the resilient team who reached the World Cup final in July as they lost 2-1 to Hungary in Budapest. Spells of confusion in the Croatian defence are likely to concern coach Zlatko Dalic in a group where four teams look like contenders for two qualifying spots for Euro 2020. Elsewhere, Wales started with a tense win over Slovakia, while Poland enjoyed a comfortable victory. Facing old rivals the Netherlands for the third time in six months, Germany enjoyed their revenge. The Dutch beat Germany 3-0 in Amsterdam in October and earned a last-gasp draw in the return fixture. Those results helped to relegate Germany from the top tier of the Nations League — further embarrassment after their terrible 2018 World Cup campaign when they failed to advance from the group stage. Germany’s next opponent, Belarus, lost 2-1 to group leaders Northern Ireland, who won their second straight group game with an 87th-minute goal from substitute Josh Magennis. Eight months after reaching the World Cup final, Croatia are unexpectedly struggling. Croatia’s defence was at times overwhelmed by a spirited Hungary team, conceding one goal to a fine passing move masterminded by Balazs Dzsudzsak, and the other after panicky set-piece defending. A 6-0 loss to Spain in the Nations League, a 3-2 win over Spain soon after and Thursday’s laboured 2-1 win over Azerbaijan have highlighted Croatia’s moments of brilliance and their vulnerabilities after losing key players to international retirement and injury. Croatia, Hungary, Wales and Slovakia are level on three points in Group E. Last-placed Azerbaijan have no points. Austria gave up a 1-0 lead as they lost 4-2 to Israel and are level with Latvia at the bottom of the group with no points from their opening two games. Eran Zahavi scored a hat-trick as Israel earned their first win over Austria for 20 years. Macedonia are level with Israel on four points after drawing 1-1 with Slovenia.